© Antelo et al. ; Licensee Bentham Open. Man-in-the-barrel syndrome was initially observed in patients with signs of serious cerebral hypoperfusion, in the border zone of the anterior and medial cerebral artery, but other causes were communicated later. a healthy 43-year-old woman who showed intense cervical pain, irradiating over both shoulders and arms. Physical examination on admission highlighted notable brachial diparesis, tacto-algesic hypoesthesia of both arms and sensory level C4-D9. cervical Magnetic Resonance Imaging (MRI) on admission revealed a hyperintense intramedullar lesion at C3-C7 level, due to a cervical cord infarction. our case reveals that conventional neurological consideration about the specific anatomical location of man-in-the-barrel syndrome in the brain should be extended to other locations such as the cervical column and not only the brain area. Keywords: Spinal cord infarction, man-in-the-barrel, brachial diplegia, stroke. “Man-in-the-barrel” syndrome (MBS) was reported for the first time in 1969 by J. Mohr as a clinical condition characterized by brachial diplegia with motor function preserved in the legs and facial musculature, which gives the patient an aspect of being constrained in a barrel . This syndrome was initially observed in patients with signs of serious cerebral hypoperfusion, in which there was bilateral ischaemia in the border zones of the anterior and medial cerebral arteries, and has a very serious prognosis . Subsequently, cases of MBS because of a lesion at the same location have been published but not due to cerebral ischaemia, but rather secondary to multiple bilateral brain metastases , haemorrhagic contusion , multiple sclerosis lesions, pneumococcal meningitis , etc. A bilateral brain condition in the border zone is not the only cause of MBS; bilateral lesions of the brachial plexus , cervical spondyloarthrosis myelopathy and central pontine myelinosis , among other conditions, may also cause this syndrome. Cervical medullary infarct, due as much to aetiology as to location, is an exceptional cause of MBS, for this reason we find this especially interesting to take into account. The MRI (magnetic resonance imaging) is the gold standard to reach a diagnosis. Unlike other diseases, a MRI performed in the early hours after infarction, may be normal, but soon will appear in the infarcted territory an intramedullary hyperintensity on T2-weighted sequences. The cord edema produced may result in a widening core. Several weeks later, the infarcted area leaves a residual myelomalacia. After bending down to tie her shoes, a healthy 43-year-old woman showed intense cervical pain, irradiating over both shoulders and arms, with numbness and paresis of both arms. Physical examination on admission highlighted evident brachial diparesis, with mainly distal and left impairment. The muscular balance was 5/5 in the right deltoids, 4/5 on the left and 0/5 in the musculature of both hands, associated with left upper arm hyporreflexia with reflexes preserved on the other arm. As for sensitivity, the patient presented tacto-algesic hypoesthesia of both arms and C4-D9 sensory level. The remaining neurological examination was completely anodine. A series of additional studies, which enabled us to confirm clinical suspicion of cervical medullary lesion, were performed. Cervical MRI on admission revealed a hyperintense intramedullary lesion in T2 at C3-C7 level (Fig. 1), with totally normal cerebral imaging. An arteriography was performed making possible to observe the vertebral, anterior spinal and anterior radiculo-medullary arteries including C7, with no abnormalities found. 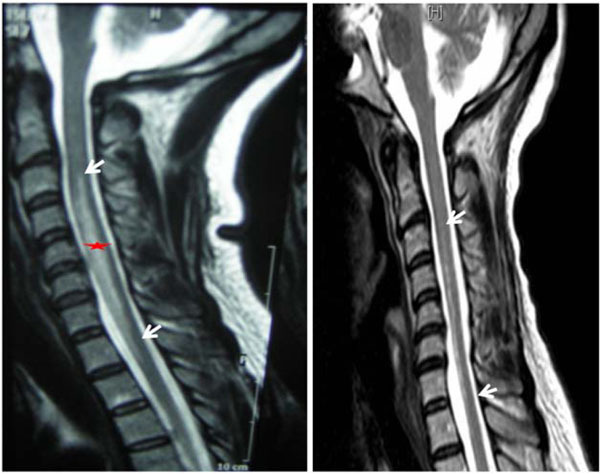 Left: hyperintense intramedullary lesion in T2 at the level C3-C7 (arrows), indicate acute cervical spinal cord infarction. Right: MR sagittal T2: myelomalacia cavity C3-C7 in control after a month. The star indicates the infarcted area. All laboratory studies, the hypercoagulability test, cerebrospinal fluid (CSF) analysis (negative oligoclonal bands), chest x-rays, ECG and echocardiogram were all normal. Visual, auditory and somatosensory evoked potentials resulted within normal limits. Given the suspicion of cervical medullary infarct we established treatment with acetyl-salicyclic acid (ASA) and intensive rehabilitation. Clinical evolution was favourable showing residual mainly distal brachial diparaesthesia, with amyotrophy and flexor tendency of the fingers on both hands, abolished left tricipital reflex and mild bibrachial tacto-algesic hypoesthesia. Cervical MRI performed after one month revealed myelomalacia and cavity formation at C3-C7. Man-in-the-barrel syndrome was initially observed in patients with signs of serious cerebral hypoperfusion in which there was bilateral ischaemia in the border zones of the anterior and medial cerebral arteries. This location corresponds to areas which are particularly sensitive to a cerebral blood flow reduction because they are irrigated by terminal anastomosis of arterioles coming from cerebral arteries. When we carried out a review of what has been published in the literature since the first case of man-in-the-barrel reported in 1969 by J. Mohr  so far, we found that there have been many and varied clinical cases related to this clinical presentation. We can highlight some examples such as the cases of MBS related to bilateral brain infarcts in borderline zones due to brain hypoxia, such as the one reported by Larrondo et al. in 2004  referring to a patient who suffered from an acute cholangitis and underwent a cholecystectomy, or the case published by Sanz-Ayan et al. in which bilateral cerebral ischaemia occurred because of hypoxia which followed an intervention to replace an aortic valve . There are reported cases of non-ischemic pathology as a form of presentation of this syndrome, mainly spontaneous or post-traumatic bilateral brain haemorrhages [4,10]. However, other aetiologies have also caused MBS, such as the patient in which clinical symptoms were because of multiple brain metastases (Moore et al. in 1989) , or the patient suffering from multiple sclerosis with demyelinising lesions (Smet in 1992). Arboix et al. reported this syndrome in 1991 in a patient with arteritis following meningococcal meningitis , and Deleu related this to central pontine myelinosis―a case published in 2005 . In general, these are isolated cases, without reviews of studies, because of the rarity of the clinical presentation. In the last few years cases of MBS in which the brain and medulla are not affected have appeared in the literature; the involvement of peripheral nervous system anatomy is what leads to brachial diplegia. In 2002, Foncea et al. reported the case of a patient with MBS symptoms following a bilateral lesion of the brachial plexus after surgery for a subphrenic abdominal abscess, and Díaz-Nicolas et al. in 2008  reported a similar case in which the lesion also occurred following abdominal surgery but in this case scheduled to perform a protocolectomy in a patient with Crohn's disease. In relation to the peripheral nervous system condition Luengo-Alvarez et al. reported a case of idiopathic bilateral amytrophic neuralgia as a cause of "man-in-the-barrel" in 2006. There are also reported cases caused by radiation, spondyloarthrosis myelopathy  or medullary ischaemia. The first few cases of MBS reported were associated with an unfortunate prognosis because of the extensive brain damage, with high mortality. However, cases caused by an extracerebral condition, the reason for this article, entail less mortality and a more favourable prognosis. Medullary infarct is much less common than cerebral infarct  and with different aetiology, although there may also be an embolic or atherosclerotic mechanism involved. The clinical presentation usually starts with a sudden onset with motor and sensory involvement below the level of the lesion, associated with intense pain at the level of the ischaemia. If the cervical lesion of the anterior spinal artery occurs with acute tetraplegia there is dissociated involvement of sensitivity and sphincters impairment. However, it is not uncommon for spinal syndromes to have incomplete clinical presentation because they may affect some branches in an isolated way, which in the case of the anterior spinal artery causes man-in-the-barrel syndrome [15,16]. There are less than 10 cases of MBS caused by cervical infarcts published in the literature. They may occur because of thrombosis of the vertebral artery which produces hypoperfusion of the anterior spinal artery, occasionally with involvement of the vertebro-basilar system [17,18]. In some cases the involvement of the vertebral artery is because of a dissection , or may also be due to stenosis of the subclavian artery . However, there are also cases in which MBS became apparent because of medullary infarct in the area of the anterior spinal artery without demonstrating any of the mentionated causes above; diagnosis is therefore established by the patient's clinical imaging and context [21-24]. In our patient a brain computed axial tomography (CAT) scan and MRI ruled out an intracranial lesion. Presentation with intense pain in the cervical region after an effort led us to consider a medullary infarct as the first possibility with distribution over the area of the anterior spinal artery, confirmed with a cervico-dorsal MRI. The arteriography performed was normal; this enabled visualising both vertebral arteries throughout its path, the anterior spinal artery on a cervico-dorsal level and the anterior radiculo-medullary arteries which did not reveal any sign of dissection, stenosis or occlusion. Our patient's clinical picture seems to be the consequence of a transitory occlusion due to an extrinsic compression of the radiculo-medullary anterior artery C7―a branch of the anterior spinal artery. This occlusion occured against the anterior wall of the spinal canal because of the forced position of the cervical vertebral column exerted especially on the low cervical column, specifically at the entrance of this artery, which is close to the surface in this location . The fact that there is a motor and sensory deficit in the muscles innervated by the C7 segment, root or myotome, favours a priority, selective obstruction, of the C7 radiculo-medullary anterior artery. Upon the side of the transitory occlusion of this artery as the real cause of the cervical anterior spinal artery syndrome, is that this artery is the principal affluent of the anterior spinal artery after following the trajectory and irrigating the C7 anterior root. Symptoms result from the involvement of the 2/3 previous branches from the spinal medulla, which has to be attributed to hypoxia or anoxia of this part of the medulla and the C7 anterior root itself. This degree of hypoxia and radicular residual anoxic lesion is shown in Fig. (2). 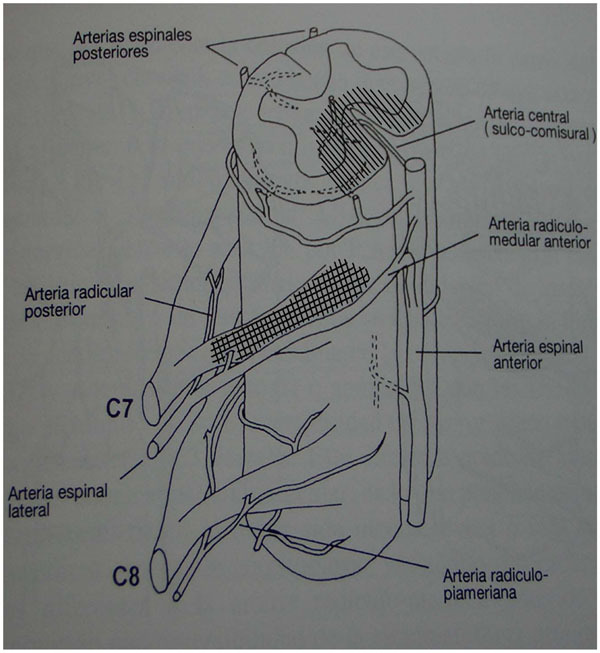 The ischaemia undergone by the C7 root would have left an irreversible lesion by virtue of the terminal nature of the irrigation branches aimed there arising from the homologous radicular artery, without the possibility for arterial replacements. The period of ischaemia following the occlusion would have been sufficient to have caused the cervical infarct because the reperfusion movement had probably been too low or had commenced too late to enable reversibility of the damage caused by the ischaemia. Arterial supply of the lower cervical spine. The hatched areas correspond to ischemic territories. Our patient's clinical condition complies with cervical medullary infarct criteria because of the anterior spinal artery impairment with pseudoradicular paraesthesia of the hands (caused by ischaemia of the anterior horn of the medulla) and with thermal-algesic sensitivity involvement, but without another kind of sensory condition because the posterior cords are respected. The work was presented at the Annual Meeting of the Sociedade Galega de Neuroloxía in April 2009 in Ourense, in the form of poster-type communication. We have no received any funding for the publicationnof this work. Mohr JR. Distal field infarction Neurology 1969; 19: 279. Howard R, Trend P, Ross RW, Russel R. Clinical features of ischemia in cerebral anterior border zones after periods of reduced cerebral bood flow Arch Neurol 1987; 44: 934-40. Moore AP, Humphrey PRD. Man-in-the-barrel syndrome caused by cerebral metastasis Neurology 1989; 39: 1134-5. Crisostomo EA, Suslavich FJ. Man-in-the-barrel syndrome associated with closed head injury J Neuroimaging 1994; 4: 116-7. Arboix A, Massins J, Oliviees M, Titus F. Síndrome del hombre en el barril Med Clin 1991; 96: 476. Foncea N, Yurrebaso I, Gomez Beldarrain M, García-Moncó JC. Plexopatía braquial bilateral simulando el síndrome del “hombre en el barril” Neurología 2002; 17: 388-90. Dirk D, Khalid S, Boulenouar M, Abbas El S, Hassan Al H, Yolande H. “Man-in-the-barrel” syndrome as delayed manifestation of extrapontine and central pontine myelinolisis: Beneficial effect of intravenous immunoglobulin J Neurol Sci 2005; 237: 103-6. Larrondo FJ, Mery V, Mellado P, Bugedo G. Síndrome del “hombre en el barril”. Reporte de un caso y revisión de la literatura Rev Chil Med Intensiva 2004; 19(1 ): 21-3. Sanz-Ayán MP, Rodríguez-Palero S, Garzón-Márquez FM, Sánchez-Callejas S. Síndrome del hombre en barril? A prop sito de un caso Rehabilitación 2008; 42: 256-9. Marcos MM, Adeva T, Blánquez M. síndrome del hombre en el barril Rev Neurol 1999; 28(2 ): 212. Díaz-Nicolás S, López-Fernández JC, González-Hernández A, Alemany-Rodríguez MJ, Pérez-Viéitez MC, Araña-Toledo V. Plexopatía braquial bilateral aguda tras una cirugía abdominal que imita el síndrome del “hombre en el barril” Rev Neurol 2008; 47(12 ): 670-2. Luengo-Álvarez J, Ramírez-Moreno JM, Falcón-García A, Casado-Naranjo I. Neuralgia amiotrófica bilateral y simétrica que simula el síndrome del “hombre en el barril” Rev Neurol 2006; 43(2 ): 123-4. Rodríguez-Vico JS, Berrocal-Izquierdo N, Duarte J. Mielopatía cervical espondilótica aguda como causa de síndrome del ‘hombre en el barril’ Rev Neurol 2010; 51: 701-3. William P, Cheshire Cesar C, Santos E, Wayne Massey, James F. Howard. Spinal cord infarction: etiology and outcome Neurology 1996; 47: 321-0. Barth A, Bogousslavsky J, Caplan LR. Spinal stroke síndromes In: Bogousslavsky J, Caplan L, Eds. Stroke síndromes. Cambridge: Cambridge University Press 1995; pp. 395-402. Carcin R, Godlewski S, Rondot P. Etude clinique des medullopathies dórigine vasculaire Rev Neurol 1962; 106: 558-91. Ben Sassi S, El Euch G, Regaieg A, et al. Man-in-the-Barrel Syndrome with comination of infarctions in the anterior spinal artery and posterior inferior cerebellar artery territories Cerebrovasc Dis 2009; 27: 201-. Strupp M, Brückmann H, Hamann GF, et al. Simultaneous brachial diplegia and rotational vertigo due to combined spinal anterior and vertebrobasilar embolism Eur Neurol 2000; 43: 240-. Berg D, Müllges W, Koltzenburg M, Bendszus M, Reiners K. Man-in-the-barrel syndrome caused by cervical spinal cord infarction Acta Neurol Scand 1998; 97: 417-9. Rughani AI, Visioni A, Hamill RW, et al. Subclavian artery stenosis causing transient bilateral brachial diplegia: an unusual cause of anterior spinal artery syndrome J Neurosurg Spine 2008; 9: 191-5. Renard JF, Massardier E, Iasci L, et al. Brachial diplegia caused by cervical spinal cord ischemia. A Case Rev Neurol (Paris) 1997; 153: 690-3. Suh DC, Kim SJ, Jung SM, Park MS, Lee J-H, Rhim SC. MRI in presumed cervical anterior spinal artery territory infarcts Neuroradiology 1996; 38: 56-8. Christian S, Jay PM, Max S, et al. Acute bilateral arm paresis Cerebrovasc Dis 2000; 10: 239-43. Balaratnam M, Pullicino P. Teaching Neuroimages: acute bilateral hand weakness from anterior spinal artery territory cord ischemia Neurology 2009; 73(3 ): 13. Rubio F, Sancho J. Patología Vascular Medular Grupo de estudio de enfermedades cerebrovasculares de Sociedad Española de Neurología. 1st ed. Colombia: Páginas 1993; pp. 35-83.